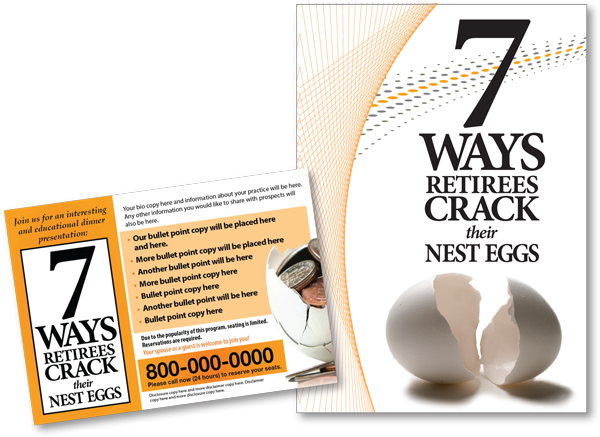 A tried, proven, and continually effective presentation that presents a compelling discussion on the 7 practical topics that need to be understood and addressed to have a successful financial retirement. This presentation is perfect for a well rounded practice. It presents the problems, but not solutions so that a visit to your office will be the next step. Working Capital Not working...All Eggs in One Basket? The Income Test - How to properly and carefully design income planning; incorporating current income sources and newly created sources. Risks — Unnecessary to Meet Goals, But Could Create a Disaster! Inflation — Treadmill, Reverse Growth, Shrinkage, Health Care Costs: How They Affect Retirees. Taxes — As They Pertain to IRA’s, Tax Reduction, Succession Planning, Destroying Nest Eggs. Long Term Care Risk. The Ignored Healthcare Problem. Proper Legal Documents Including Trusts.